In proposing Astana as the venue for the Syrian peace negotiations, Kazakhstan’s president Nursultan Nazarbayev certainly wasn’t expecting Turkey, one of the main regional players and a NATO member, to block the adoption of documents aimed at establishing the so-called “de-escalation zones” plan in Syria. Nevertheless, the temporary failure to achieve a result is rather a setback for Moscow, not for Astana. The fifth round of the negotiations on 4-5 July ended without an agreement. The meeting gathered diplomats from Russia, Iran and Turkey in Astana but in spite of the failure of the negotiations, Moscow’s chief negotiator Aleksandr Lavrentyev said that the basic framework had been “essentially agreed”. Lavrentyev explained then, after two days of talks, that details of the proposed zones, such as the territory they cover and what forces would participate, still “need finalising” because Turkish officials had asked for more time to coordinate their participation in the zones designed to separate rebel fighters and government troops of Syrian president Bashar al-Assad. At the same time, on 4 July, a representative of Syria’s opposition in Astana had already said the armed opposition to Bashar al-Assad disagrees with a proposal for Iran’s military to monitor some areas, because Iranian forces fight on the side of the Syrian government’s troops. Kazakh foreign minister Kairat Abdrakhmanov said Russia, Turkey, and Iran had agreed to restart talks in Astana at the end of August. 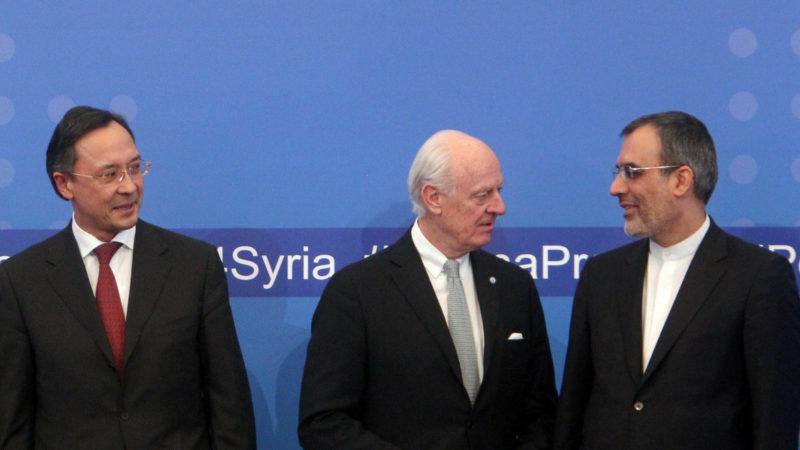 Staffan de Mistura, the UN secretary-general’s special envoy on Syria – who attended the Astana meeting – emphasised that the de-escalation zones can only be a temporary measure and that a wider political solution is necessary to settle the conflict. Besides Lavrentyev, the Astana talks were attended by Syrian envoy Bashar al-Jaafari, Iranian deputy foreign minister Hossein Jaberi Ansari, Turkish deputy foreign minister Sedat Onal, and the acting US assistant secretary of state for the Near East Affairs Bureau, Stuart Jones. Negotiations over Syria’s future are separated into two elements. One, in Astana, is co-sponsored by Russia, Turkey, and Iran and concerns immediate cease-fire conditions. The other talks, in Geneva, are sponsored by the UN and focus on a longer-term political solution. Russia and Iran back Assad’s government, while the United States and Turkey support different rebel groups. US Secretary of State Rex Tillerson has already raised the possibility of a joint initiative with Moscow to promote stability in Syria and urged all parties fighting Islamic State militants in the country to avoid conflict with one another. “The United States is prepared to explore the possibility of establishing with Russia joint mechanisms for ensuring stability, including no-fly zones, on the ground ceasefire observers, and coordinated delivery of humanitarian assistance,” Tillerson said in a statement issued by the State Department. “If our two countries work together to establish stability on the ground, it will lay a foundation for progress on the settlement of Syria’s political future,” he said in the statement, which did not directly address the Astana talks. The Astana talks, which began in January, come at a time when Turkey and Russia each want to pull themselves out of the fighting. Russia has called on member countries of the Moscow-led Commonwealth of Independent States, reuniting nine of the former Soviet republics, including Kazakhstan, to consider providing military observers for the potential de-escalation zones. Russian military officials are now holding talks with their colleagues in Kazakhstan and Kyrgyzstan about the potential deployment of Kazakh and Kyrgyz peacekeepers to Syria. Kazakhstan’s refusal to accept Russia’s CSTO military intervention proposal in Syria can be explained by president Nazarbayev’s concerns that deploying Kazakh troops in conflict zones could cause political instability inside Kazakhstan. Kazakhstan’s insistence that it would not deploy military personnel in Syria contrasts also with Kyrgyzstan’s openness to a potential deployment, and shows the beginning of a rift between Astana and Moscow over the mandate of the common Collective Security Treaty Organisation (CSTO). While Russia has pushed the CSTO in an interventionist direction to boost its international credibility as a peacekeeping force, Kazakhstan has argued that the CSTO should refrain from military involvement in Syria. Astana’s support for a neutral CSTO can mainly be explained by a serious internal opposition to Kazakh military deployment in conflict zones. But in addition to the possible internal political instability that could result from sending troops to Syria, Kazakhstan’s tensions with Russia over the CSTO’s mandate also show Nazarbayev’s desire to prove that Astana’s foreign policy is independent from Moscow. All that Kazakhstan wants to offer is the venue for the talks: Astana. Kazakhstan has absolutely no tensions with Russia. EURACTIV, why are you such a dumb muffin??!?! ?..